[F]or the past 5+ years, one of the overarching narratives about Bush is that he is ‘firm’ in the face of criticism, a victim of events rather than a precipitator, under attack by whining Democrats. The mess in Iraq is due to faulty intelligence, Katrina is a generic “failure at all levels,” his disastrous second term is attributed not to him but to the benign-sounding “second-term curse,” 9/11 happened on his watch but mysteriously terrorism is his strength, he can defy the law on warrantless spying and the thrust of reporting is about how polls are split, the Plame leak is Libby’s fault or Rove’s fault or McClellan’s fault or the Democrats’ fault or the media’s fault, and on and on. Bush is rarely, if ever, directly blamed for the mess he’s created. The subtext, therefore, is that he is infallible. It’s no accident that when asked at a presser, Bush couldn’t think of a single mistake he’d made. And it’s no accident that the administration never admits errors in judgment and is pathologically incapable of firing anyone, no matter how egregious the screw-up. As far as Cheney is concerned, he shoots a man in the face and the victim apologizes to him. Need I say more about infallibility? Daou is one of the most brilliant and least partisan bloggers out there (look at his column, which always gives views from both sides). Today he wins the ultimate honor, a place on my coveted blogroll. A guest post from Jerome Keating. Some called it a bombshell but it was only the bursting of a bubble. Taiwan’s President Chen Shui-bian has recently caused quite a stir among the biased and uninformed by proposing to abolish the country’s ineffective National Unification Council (NUC). The continued flap over the NUC and its guidelines highlights that most people know nothing about this outdated and ineffective organization, how the guidelines themselves contradict reality, and how the council comes from an era when the Kuomintang (KMT) wished to substitute its personal agenda for that of the people of Taiwan. Formed back in 1990 (six years before Taiwan’s people were allowed to directly elect their President) the NUC represents a last ditch effort by the KMT to explain and justify its continued forty plus years of martial law and one-party state rule i.e. their alleged purpose all along was democracy. The council adopted the present guidelines at its third meeting on February 23, 1991. First examine this; the Pan-blue dominated Legislature in typical hypocritical fashion cries at how President Chen does not have the best interests of the people in mind. That same Pan-blue Legislature had just cut the annual budget of the NUC to a mere US thirty-two dollars—barely enough to pay to install a phone or get fax paper for less than a month. This is more than a slap in the face to the NUC, it confirms that even the Pan-blues consider the NUC useless but it further insults the people of Taiwan. Unlinkable, by NY Times editor Robert Semple Jr. This topic created a really nasty comment war last year on this blog, when one commenter insisted any mention of the possibility of the world running out of oil was foolish, juvenile and ignorant. (Funny, that’s just what I thought of his comments.) It’s not going to happen tomorrow, but the crisis may not be that far off, either. When President Bush declared in his 2006 State of the Union address that America must cure its “addiction to oil,” he framed his case largely in terms of national security — the need to liberate the country from of its dependence on volatile and in some cases hostile nations for much of its energy. He failed to mention two other good reasons to sober up. Both are at least as pressing as national security. More than 1,300 killed over the past week in Iraq’s civil war. Of course, there’s not a word of this over at LGF and most of the other war-bloggers’ sites, where they’ve dutifully placed their heads deep and conveniently in the sand. You simply have to read it. Thanks to Bill Stimson for calling it to my attention. It comes to the same conclusion I do: China’s moment of truth will be the “stress test,” when a recession or other catastrophe tests the system. That’s when we’ll know whether China’s rise was a lot of hot air or a true economic miracle. China put down the revolt with brutal repression, terror, and massacre. Mainland soldiers and police fired first killing thousands indiscriminately; then, more selectively, hunted down and jailed or slaughtered students, intellectuals, prominent business men, and civic leaders. It’s a national holiday today in Taiwan, and most businesses are closed. It is to Taiwan’s credit that it acknowledges its own act of barbarism, and that it invites the public to examine it for themselves. (Still, some contend the government hasn’t gone far enough in weeding out the instigators of 228 and that many of the worst offenders have gone unpunished to this day.) I wonder if we’ll ever see a similar national holiday in China commemorating the Tiananmen Square Massacre or the Great Leap Forward or other treats that the CCP bestowed on its citizens. The fact that Taiwan has grown from a savage place where its Chinese leaders could launch acts of terror that would have made Stalin proud into the prosperous, peaceful nation it is today should hold lessons for each of us, and perhaps give us hope that China, too, might one day shed its mantle of tyranny and become a country of laws and of openness. I see no sign of that happening now, but I probably wouldn’t have seen such signs in Taiwan back in the 1940s or 50s. What will it take? If Taiwan could do it, could the PRC do it as well? What was the turning point, and is China anywhere near such a pivotal moment? A thread by any other name….. 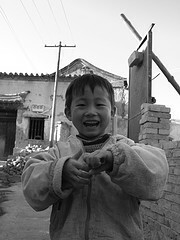 I wish I felt as happy as this Yunnan villager today. What a smile. One of the most populare memes of recent monmths has been that the US soldiers fighting in Iraq perceive the war to be a good thing, a war we are winning and a war they want to continue fighting. This is rubbish, of course, and Kristof says why. The Soldiers Speak. Will President Bush Listen? When President Bush held a public meeting with troops by satellite last fall, they were miraculously upbeat. And all along, unrepentant hawks (most of whom have never been to Iraq) have insisted that journalists are misreporting Iraq and that most soldiers are gung-ho about their mission. Hogwash! A new poll to be released today shows that U.S. soldiers overwhelmingly want out of Iraq — and soon. So it’s impossible for me to put up new stuff at the moment. It’s the week from hell. I should be back in form by Wednesday afternoon, when the Big Project ends. In the meantime, there are now hundreds of succulent posts in the new Duck Pond, where registered members now number above 60. It actually seems to have worked.